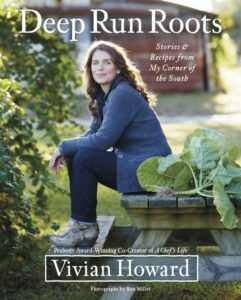 Celebrity chef Vivian Howard is nationally known for elevating traditional Southern dishes and showcasing North Carolina’s food history. At her restaurant Chef & the Farmer in Kinston, Howard focuses on creative cooking inspired by the state’s ingredients and traditions. On her PBS show A Chef’s Life, viewers see Howard as a chef leading a busy farm-to-fork restaurant, but also as a daughter, wife, and mother to six-year-old twins. When Howard isn’t working long hours at Chef & the Farmer, she’s filming for PBS, traveling for cooking/speaking engagements or testing new recipes for her restaurants. (Howard also owns The Boiler Room in Kinston and newly opened Benny’s Big Time Pizzeria in Wilmington.) With such a hectic schedule, focusing on healthy, fresh meals for her family can be tough. Fortunately, Howard found time to talk with Blue Cross NC about some tips on finding time for meal prep and using basic herbs and spices to jazz up go-to meals. Anything that you can prep in large amounts and use as a base for different flavors throughout the week will work. Howard suggests keeping food in the refrigerator no more than five days. 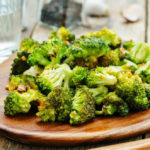 “If I do prep food on the weekends, I always make a staple that can be eaten warm or cold and with a variety of seasonings. If I’m roasting or searing meat, I only use salt. 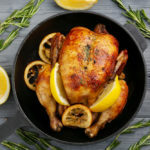 Pepper and other spices can burn over high heat, and I want to keep the flavors pretty basic so I can season meals differently throughout the week. Sometimes I’ll roast a whole chicken on a Sunday, and we’ll eat that for dinner. Then I’ll make chicken salad with the leftovers. The same with a flank steak – I’ll sear that for dinner one night and use what’s left to make an Asian-style steak salad. The easiest way to refresh a favorite recipe is to switch up the seasonings. Vivian suggests a few specific ingredients that can totally change the flavor profile of a dish. For Asian dishes, Vivian recommends that you keep soy sauce, sesame oil and rice vinegar on hand. Those three simple ingredients can really transform something that tastes plain or too American. Sesame seeds are a nice addition, too. 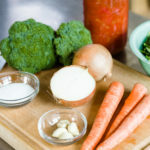 An Indian-inspired meal needs curry powder, lime juice, and coconut oil – it’s a completely different flavor blend that really surprises some people. The ingredients for a Mexican meal are readily available in most supermarkets. Chipotle peppers in adobo sauce, lime juice, and cilantro can update chicken, pork or beef for tacos, salads or bean bowls. “For beginners who might be intimidated by prepping a week’s worth of meals, try making snacks first. Since our whole family enjoys roasted vegetables, I’ll roast asparagus, broccoli, mushrooms and any other seasonal produce. We always have hummus on hand so we can have healthy, filling snacks rather than make something quick that may not be as nutritious. Do you want to ask an expert? Access nutrition counseling services by calling the number on the back of your member ID card or use “Find A Doctor” to locate a provider. Download this easy Meal Planning Calendar to help you stay on track.